Margarine is SO 1960's… Does Margarine in Restaurants Make You Crazy Too? Do you ever get frustrated with how ‘behind-the-times' so many restaurants seem to be these days? Thankfully, many places are finally beginning to get on the real foodie train (usually only part-way, and it's happening very slowly), but it's staggering the number of places we come across who are still completely in the dark. A few weeks ago Kent was up in Traverse City on a mountain biking trip with friends, so the kids and I were on our own and decided to order a pizza. We had been wanting to try this new place in town because it looked to be family-owned (I hate food chains), so I used my own little “test” to see if they were any good. “Because margarine whips up easily,” he said. We ended up ordering from the place downtown that is more expensive but they do use real food, so it's worth it, and I'd rather give them our business anyway. The butter issue is a good little indicator for me. Kent and I love to go out to eat for date night, and we're both foodies so that makes it entertainment AND food all in one, but we just won't go places that are still so NOT with it that they would use margarine. 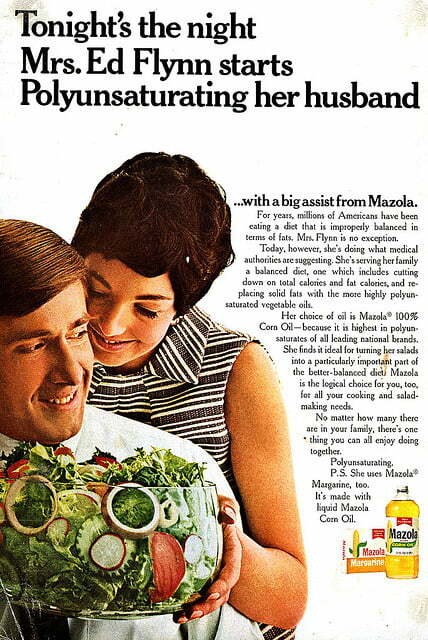 Margarine was sooo 1960's. Look at that chart above, it's obvious that it's nothing but chemicals. The part that really freaks me out is this: If a restaurant doesn't even know enough to use real butter, what else is going on behind the scenes in their kitchen?! Don't be afraid to ask questions about the restaurants you're thinking of spending your hard-earned money at, I'm convinced that the more of us who DO, the more restaurants will get their heads of out their… join us in the 21st century. How do YOU decide which restaurants you'll go to? If a place you're at doesn't have real butter, will you go there again? Margarine, as a generic term, can indicate any of a wide range of butter substitutes. In many parts of the world, margarine has become the best-selling table spread, although butter and olive oil also command large market shares. Margarine is an ingredient in the preparation of many other foods. In some regions people may refer to margarine as butter in informal speech, but in several countries laws forbid food packaging to refer to margarine as “butter”. Recipes sometimes refer to margarine as oleo. 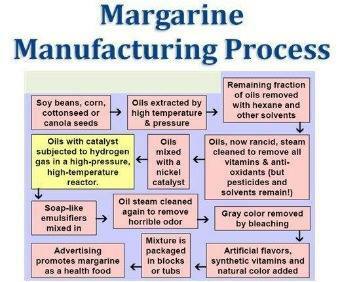 Margarine is a plastic food made from one or more optional fat ingredients churned with cultured pasteurized skim milk. It is a water-in-fat emulsion and must contain not less than 80% fat according to the standard of identity for margarine that has been published by the U.S. Food and Drug Administration. Soybean and cottonseed oils, refined and partially hydrogenated to produce a desired consistency, are extensively used in producing margarines. First, it's made with cultured pasteurized skim milk, not good. And they don't tell you that soybean and cottonseed oils are made from genetically engineered crops. Also, remember, “partially hydrogenated” means trans fats. Doesn't sound very natural or appetizing does it? 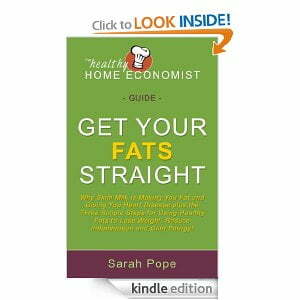 You'll love Sarah's book: Get Your Fats Straight! 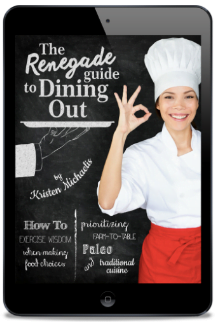 And here's another book that helps you know how to ask questions in restaurants and how to find a good place to go out to eat now and then: Get this Guide to Eating Out. In the 60s, I read a Jean Sheperd story describing how margarine users had to mix the stuff with yellow food coloring. I educated myself about margarine and refused to eat it. My parents liked the spreadability and “health benefits”. Yeah, they later died of artery-clogged strokes. I said I’d rather have a heart attack than cancer, bring me some butter. It’s hard to go to pot lucks, or friends’ places to eat, because I hate being picky. I read some waiter’s Facebook tale of going to the store for his boss to buy Cool Whip, another yucky food artifice. It’s a prime steak chain you’ve all heard of. If they serve Cool Whip instead of whipped cream, what’s sizzling in the platter with the steak? Goo article! employees to pass on such important messages). One of the employes did say that they usually wouldn’t change practices or ordering unless they had requests or complaints from 10-12 different people. Maybe if we had enough people requesting that restaurants make changes, it will get through to them. Every year, we attend the Midwest Homeschool Convention in Cincinnati and stay in the Hyatt Regency hotel. For several years in a row, I opted to pay for a very pricey breakfast in the hotel’s restaurant (their breakfast restaurant), as they touted their ingredients as coming from fresh from a local farm. For several years in a row, I was able to get a wonderful, fresh-egg omelet (gorgeous orange yolks!) cooked in real butter and loaded with lovely ham, bacon, fresh cheese, etc. and even some organic fruit. Despite the hefty price-tag, this breakfast was critical to me, as the convention itself offers very little in the way of decent food (the best they have is a chicken caesar salad, but nothing in it I’d ever pay money to eat), and the nearest “good” restaurant is at least 20 minutes away, which means missing at least 2 sessions at the convention. They ask you not to bring in outside food (though many people do), and I struggle with the line between setting a good example as a Christian in following the convention center’s rule, and in feeding my family decently. So far we’ve just done with the breakfast, then tried to “make it” on the garbage offered at the convention until after we’re done for the day, then finish off with something we’ve brought to the hotel. Anyway, this past year, I had read that the hotel was under construction on the lower levels, so I called specifically to find out if the breakfast restaurant would be open. They assured me that while its “normal location” was under construction, they had temporarily relocated it to one of the ballrooms and that it would be open for guests. So we didn’t take much food with us (just some nuts, dried fruits, a few veggies and some Nick’s Sticks). The first morning, I was horrified to find that they were charging the same price for breakfast, but only serving a slightly-buffed-up continental fare. No gourmet fresh omelets made-to-order. No oatmeal with fruit and nuts. No bacon. No hard-boiled eggs. No cream. No BUTTER! Not even when I asked…just margarine. The only yogurt was fat-free (HFCS-full) yoplait – blech! The best I was able to do that first day was a bagel loaded with full-fat philly cream cheese and I ran back to my room for my fruits, nuts and veggies to carry around with me. I almost drove the 2-hour drive back home that night to pick up a gallon of milk, some KerryGold butter and some other food, but finally just went to Whole Foods to stock up on enough “breakfast” for the rest of our convention stay. I did complain about the restaurant to the hotel management, and they comped us for that entire breakfast (4 people). And I was assured that it would be back to my “standards” when we return in 2014. Don’t let that scare you away from the convention – YOU SHOULD COME! I’ll even give you a personal introduction to my favorite speakers! 😉 But I’m definitely on the other side of the fence with regards to our eating when we go. Though my husband and kids seem to do okay with one greasy-burger-and-fry from the convention center meal a day, I felt awful for days after our last trip. We will be packing a FULL set of meals for our 2014 trip. Better to have to take stuff back home than end up there without it! Kelly. Hi. I’m local here in Ada/Greenville. I live in Greenville work in Ada. I think we get our milk at the same place;)). Anyway, I work at Nonna Cafe in Ada. Real butter, real food. We are small and just opened in May but if you appreciate real food you must visit. Scones are ALL butter and best coffee in town hands down. Thanks for telling me, Jeana! I tried to explain this to my sister, but she is stuck on her Margarine. YUK! My airline provides crew meals on longer flights. The passenger and pilot meals have a pat of butter with them. The flight attendant meals consist of a pat of margarine, a white roll, brownish iceberg lettuce with a slice of processed cheese and processed turkey on top, along with a tub of salad dressing made of ingredients that aren’t food. Yum! Even the non-foodie crewmembers won’t touch those meals. Why do pilots and passengers get butter and we’re left with margarine? Oooooh, that must burn you up! Can you organize a big rally of complaints?!!! I love that I live where I do in Connecticut and that so many restaurants are ready, willing, and DO use better quality fats. I think some of it comes from the fact that historically my area had a huge influx of immigrants from Italy a century ago and retained many of their food traditions. There’s a place down here in Tucson called “Bread and Butter”. Three guesses (and the first two don’t count) as to what they don’t have!!! Wow Allen, I hope you’ve talked to them about this?! Allen, where do you live? Maybe I can try to get some others in your area to call them as well?!! Wouldn’t that be fun?